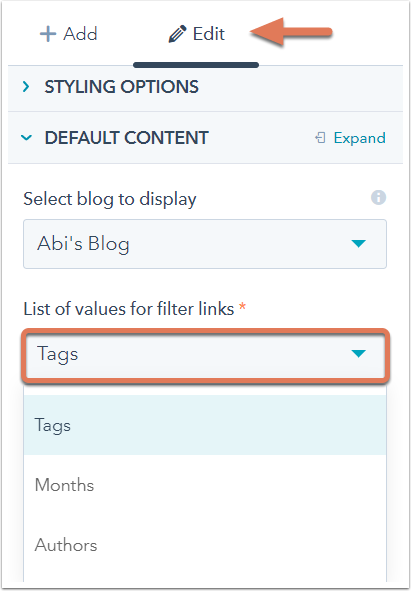 Add a Post Filter module to your blog template so visitors can filter your blog posts by tag, author, or month. In the finder, click the name of your blog template. Search for the Post Filter module. Click and drag the module into your template. Click the module once it's in your template. In the inspector under the Edit tab, click to expand the Default Content section. Use the Select blog to display dropdown menu to choose the name of your blog. Use the List of values for filter links dropdown menu to choose whether visitors can filter blog posts by Tags, Authors, or Months. A list of your tags, authors, or months will now appear on your live blog. Each link will bring users to a list of posts with that tag, written by that author, or created in that month.